I'd hate to think of the number of skulls you'd have to paint! Unfortunately given the price - NZD2,260 - I'm never likely to see one in the flesh! Though the purchase cost is roughly the same as airfares from NZ to Nottingham to see one at Warhammer World. The individual triangular Skull Towers are NZD150 each or you can buy a set of three with one-click for........$450. 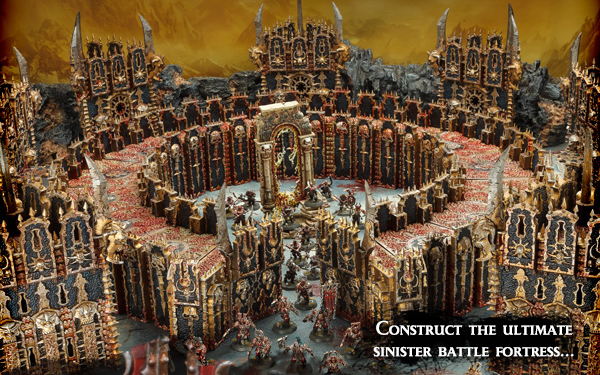 My biggest concern in buying it would be that it is manufactured in the lower quality "Chinese" plastic that recent AoS have been constructed from. There has been numerous tales of warping and poor fit. 2 Gates, 4 Bastions, 4 keeps, and 4 fortress walls all in one convenient mouse click and saving you ... $zero. "Must not offer discounts, resist the temptation, shareholders will not like." I can see individual towers being bought if you have Dark Elf or WoC armies. But I'll be interested in how many packaged sets they sell.